For a while now, coffee just hasn't agreed with my body. On any given day it could make my stomach upset, give me a headache, or actually make me more tired than before I drank it. I'm really surprised at how easy it's been for me to cut coffee out. I quit right before going to Portland, a total coffee town! I quit before going to a conference, which usually takes multiple cups off coffee to get through the hours of sessions. I've been drinking teas, and getting chai or decaf lattes to have that "I'm walking around with a warm cup of something in my hand" feeling. 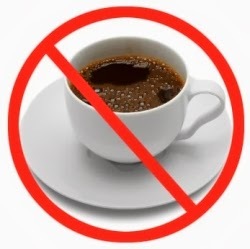 I've been wondering why it has been so easy to give up coffee, while other things that I know I shouldn't eat (processed things, fast food, french fries, etc.) take so much willpower not to have, and I fail often. I think in the end I could literally feel coffee hurting my body after I drank it, whereas when I eat bad food, it's not as definitive of a physical response. Have you given up eating/drinking something you formerly had often? Soda! And I've severely reduced my coffee intake. It wasn't nearly as hard as I expected it to be. But that might be because I noticed (and focused on) the perks instead of the pitfalls/withdrawal symptoms. Yea, I think focusing on the perks is the way to go with sticking with something. I have never really given up anything permanently but I presume if something started to make me feel bad I would let it go. I thought of ridding fast food or hard liquor completely but honestly you live once and I like French fries lol. I wish I was allergic to fried foods... It would make my life easier. Maybe your reaction to coffee is a blessing in disguise. I've been trying to give up soda for a LONG time now... it's so hard! I know a lot of sodaholics! We never drank soda when I was a kid, so I never got hooked. I guess that's a good thing! i don't eat as much candy as i used to. i was a candybaroholic for real! but since i've been doing 20 min abs everyday, i decided to limit my candy intake to get better results. yea, when you're working out it makes it easier to say no because you don't want your work to go to waste! Yes, I'm on decaf too. The high levels of caffeine started to make me feel super anxious. I think it's the spice combination that makes it so tasty! OMG - I just added giving up coffee (okay decreasing coffee intact) to my bucket list for the year. I know I need to, or at least should, but it's so tasty!